Tis the season to be jolly, and what better way to be jolly than with a classic holiday treat. 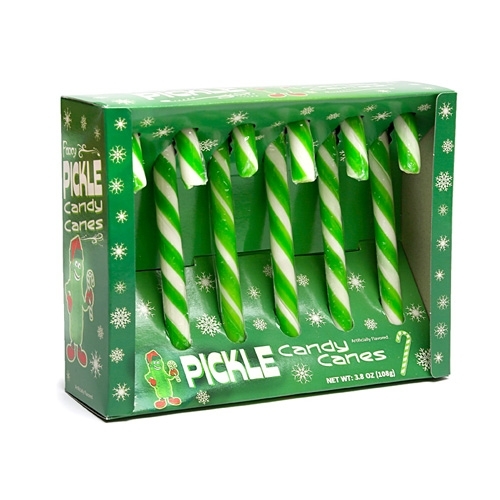 Just to keep things interesting however, these candy canes don't taste like peppermint but instead are infused with the briny flavor of pickles. 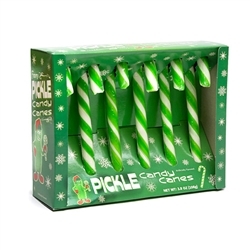 These are great to keep to yourself, or give away as stocking stuffers, or you could even leave one out for Santa in lieu of the usual boring cookies. You just might make his night which means less chance of receiving a lump of coal this year. 6-pack, individually wrapped.